This 9" twisted and damaged section of tin tubing wreckage is from the LZ-129 zeppelin Hindenburg. It was taken as a souvenir when it was held in the Akron Air Dock in Akron, OH just after the tragic crash. The tubing either carried gases or liquids, possibly to the engine. Most of all the remains of the Hindenburg were transported by railroad to Pittsburgh, Pa where it was melted down and shipped back to Germany. This particular piece was featured on the June 2011 television segment "Deals From The Dark Side." 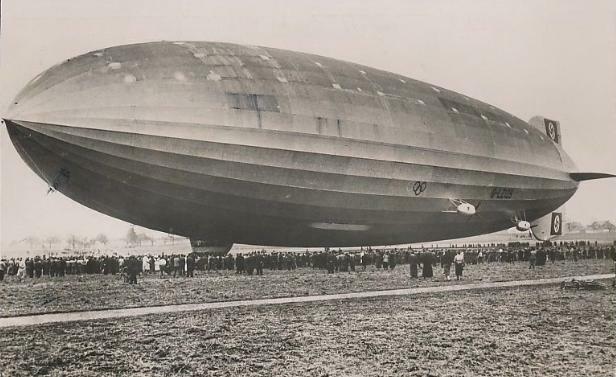 Five years after construction began, the Hindenburg made its maiden test flight from the Zeppelin dockyards at Friedrichshafen on March 4, 1936, with 87 passengers and crew aboard. This an original per-christening first flight photo of the Hindenburg taken on that date. The hull had not yet been painted.